Hannah Jeong, the Multicultural Greek Council president, was discouraged during a recent interview with The Daily Campus. MGC funding frustrations hung in the air and questions about how Student Senate funds are distributed to student groups remained unanswered. This fall, MGC requested $6,673.72 for the semester through Senate semester funding, and received $1,510.00; 23 percent of their requested budget. This wasn’t enough for MGC to function comfortably and host their biggest recruiting event and other programming for its members including leadership activities and homecoming. 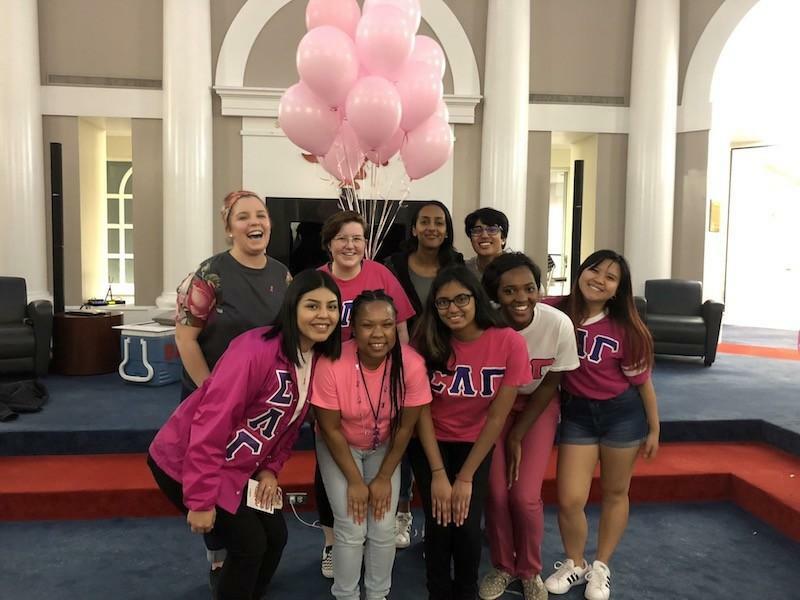 Unlike some other groups on campus that host general, fun events for SMU students, MGC offers a close-knit Greek experience, accepting students of all backgrounds who are interested in multicultural campus life. Steven Johnson, MGC’s advisor, said they host traditional programming that welcomes community members and students interested in joining the council. MGC is one of four Greek councils on campus, and one of two councils that receive funding from senate. The council has 60 members and five active chapters with both Latino/Hispanic and Asian roots. Of the student organizations on campus that receive the majority of their funding from Student Senate, MGC is not getting the fiscal support they need to function and host events as a chartered organization. Student Senate is one of the biggest financial supporters of student organizations on campus. They play a part in making groups’ events successful. But Tracy Nelson, the Senate finance chair, said the number of student groups on campus is growing, while the amount of distributable funds is staying the same. “We just don’t have enough money to go around,” Nelson said. Underfunding is the biggest unintended consequence of Senate’s limited budget, and there’s no simple fix. Funds may be spreading too thin to account for every group in need of funding. Yet with semester-to-semester funding inconsistencies, and some unclearly worded senate financial standards, MGC’s leadership wants answers and change. Funding fluctuates from semester to semester, and event to event. Organizations interested in receiving senate funds can submit a semester budget request form to senate for review, which is then presented to the chamber for approval. Since the 2013 fall semester budget request, MGC has made five semester budget requests. The percentages of funds allocated to MGC over these five semesters have been between 13 percent and 73 percent of their requested budgets. Marina Guo, the MGC financial vice president, said the council is heavily dependent on Senate funding. “Not having enough support from them really has a direct impact on how we will perform the next semester,” she said. But Johnson, who’s also the assistant director of multicultural student affairs, knows they have to work with what they get and stay positive, because the semester’s events don’t stop if they do not receive the funds they need. “We’ve been really fortunate to be able to do more with less,” Johnson said. If hiring a DJ is out of the budget, then they set up a Spotify playlist and speakers and make it work. Making it work was a bigger challenge at MGC’s biggest event of the year. Showcase, their main recruiting event, is a presentation of each chapter and the kick-off for fall recruitment. 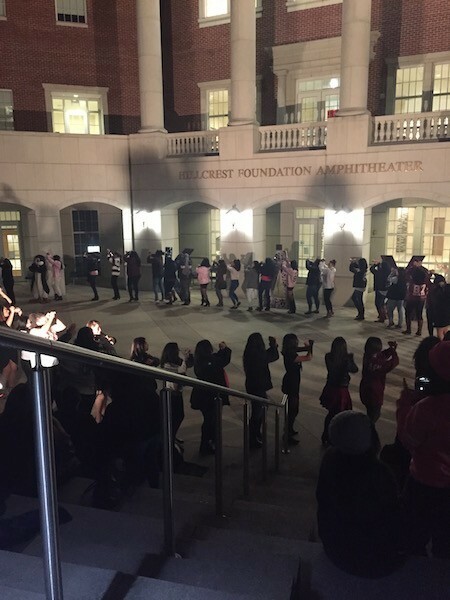 They average about 300-400 students and community members in attendance each semester. Over the past four semesters, they received an average of 26 percent of their requested budget for this event. 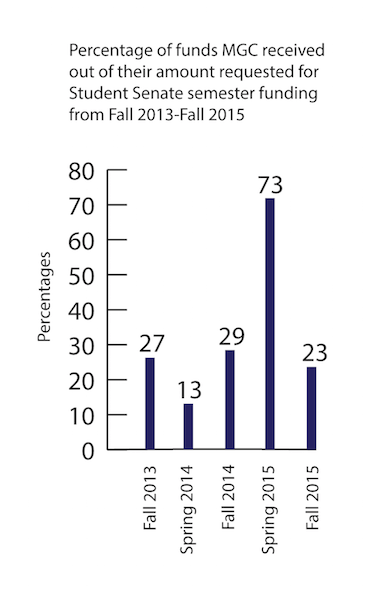 But for the fall 2015 semester, they received a mere 3.4 percent of their requested budget of $290. The 3.4 percent amounted to $10. “That was hilarious,” Jeong said. Johnson also felt like the allotted funds were not substantial. “We didn’t really use it,” Johnson said. With that many people in attendance, $10 didn’t contribute too much, not even for the food. “We would like to at least be able to provide them with some food, as a thank you,” he said. There is also confusion with how to properly fill out budget request forms. To maximize chances for receive funding, groups must meet the requirements laid out in the senate finance committee standards for budget allocation, and understand how to correctly complete the form, where groups must provide a detailed description of each event and of each item needing funding. 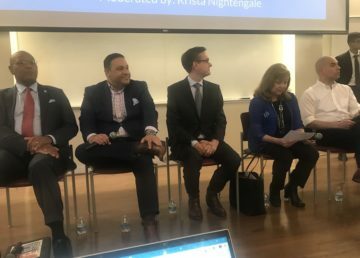 The finance committee looks at past financial responsibility and event success, the organization’s capacity, and how the events benefit the SMU community. Most of MGC’s events are repeated either on a semester or yearly basis, so the event descriptions aren’t typically altered from semester to semester. But even subtle changes in the food descriptions can change how much a group receives. The senate finance committee standards, last updated in 2013, specifically state: “the Committee will consider funding for food at a specific event if said food is deemed to be a critical component of the event.” This refers to food that’s significant to event culture or the event’s purpose, rather than serving arbitrary snacks. MGC’s food request for the fall 2015 Showcase was pizza and cookies for guests. They requested $250 for food, and received no money at all, which could mean that the food choice wasn’t considered critical to the event. Yet the group has in fact received money in the past for the same request for pizza and cookies. “We like to try to diversify our food,” Johnson said. MGC tries to provide options outside of typical, historical cuisine choices. Jeong also found this senate standard outdated, and even stereotypical. Nelson and the student senate committee have looked into the food standard and she recognized this problem. With the current race tensions on campus and around the U.S., fairness and diversity are now top-of-the-mind issues. Going forward, Johnson knows it will take time to straighten out the kinks. “Like most things that have gone awry, these things aren’t going to be a quick fix,” he said.